The Norwegian broadcaster NRK have revealed the art theme and slogan for the forthcoming Eurovision Song Contest in Oslo. The show will feature the ‘Share The Moment’ theme. The theme was announced at a press conference held on 4 December in Oslo. 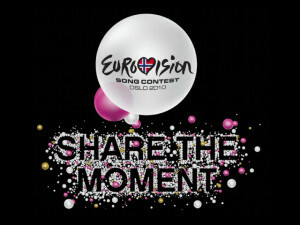 The design of the 2010 Eurovision Song Contest was designed by popular Norwegian design companies Gosu, Handverk and Snøhetta. The Executive Supervisor of the contest, Svante Stockselius, commented that he "has never seen a host broadcaster being this well prepared at this time of the year". The coloured spheres represent gathering people from all the competing nations and the different emotions surrounding the Eurovision Song Contest. The theme will be seen in the semi-finals and final and in events leading up to the Eurovision Song Contest next May. ← “On again, off again… like the rhythm of rain….